I’m on the hunt for a bag. Actually, two. 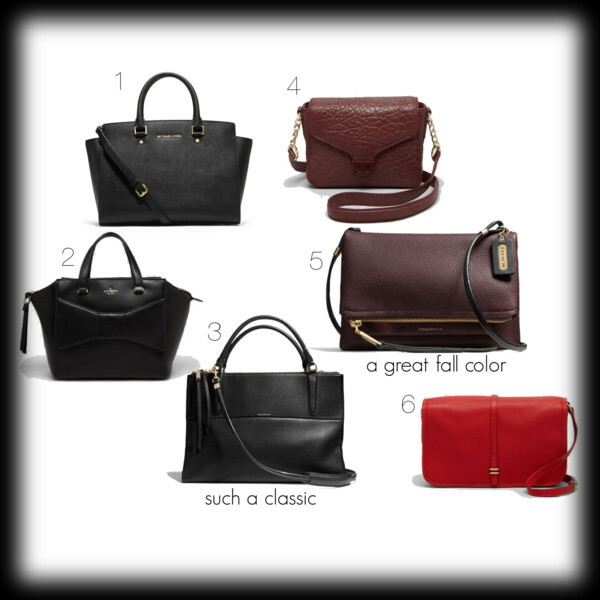 One tote/satchel in black, and one crossbody in some shade of red. The tote needs to be classic and practical, something I can use for interviews (the Zara one I ordered didn’t work out and has been returned) and for when I want to be a little bit more polished. It needs to go with everything, but it still needs to be stylish. I’m debating over the three above. The Kate Spade tote (#2) is fun, and the bow is an adorable way to have a functioning pocket, but I’m not really a bow person. The Michael Kors (#1) has structure, is made of saffiano leather, and has a fairly minimal logo, all of which are pluses in my book. The con? It has one main compartment with no interior dividers, aside from the customary phone pocket and back zip pocket. The Coach (#3) is breathtakingly simple, with discreet metal hardware, a longer strap option, and multiple interior pockets. The con? The price. The medium size tops out at over $500. As for the crossbody, I want it to be in red. I was thinking more of a maroon because it would be easier to go with everything, but I included the Marc by Marc Jacobs (#6) because of the simple design and the fantastic bright red. I like the texture of the Tory Burch one (#4) but I’m not loving the chain/leather strap and the fairly small size. The Coach one (#5) is casual yet elegant at the same time, and I love the contrast of the black straps against the rich oxblood. Again, the price is tough to swallow at $268, but it’s actually the cheapest of the three by a long shot. I’m still considering and will be for awhile, but I think Coach wins out again. I’m a sucker for clean, classic lines, judicious use of hardware, simple logos, and sumptuous leather, which is what the brand has been putting out in spades for the last couple of years. I’ll be saving my pennies…and dropping hints. wink wink.